Review: Like the legend of Apollonius and Celiane that forms the foundation for the anime’s plotline, the Aquarion franchise seems destined to also go through iterations. And in each turn, you can definitely count on the silliness inherent in having giant robots powered by teenagers’ libidinal hormones and all the jokes that spill forth from that premise to remain. Thank goodness, then, that the latest entry, Aquarion EVOL, preserves what is perhaps the best element of the franchise: Yoko Kanno, who, once again, composes a stellar score that carries with it a dignity that is oh-so-slightly at odds with the show’s wonky premise. Apart from the mysterious-sounding choral opener titled “Pandora, Pandora,” Yoko Kanno immediately gets to work by unleashing her pop-ish energy and making full use of Akino Kawamitsu’s vocals to dazzle the listener. 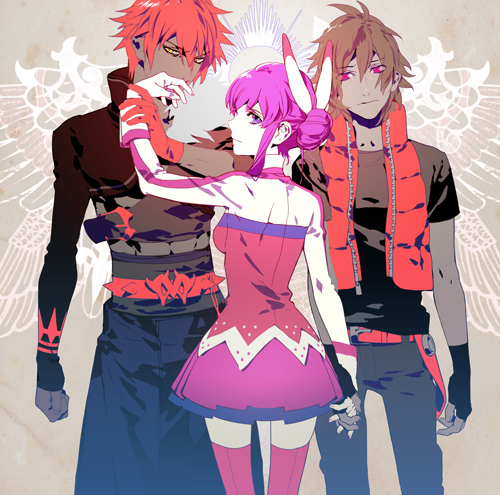 Aquarion EVOL’s “Paradoxical ZOO” and “Fragments of Eve” are reminiscent of many of Kanno’s past songs; the former bears traces of the vocal flourishes that marked Genesis of Aquarion’s “Go Tight!” while the latter’s chorus brims with so much energy that it can overbearing at times. There’s no denying the strong stamp they make upon this album and much of that credit is courtesy of AKINO and how unrelenting she can be when she’s belting it out. With two high-energy tracks placed back to back, the whole affair feels like a vocal and instrumental extravaganza that is thrilling and exhausting without any end in sight. The bass solo in “Beast Beat,” featuring KenKen, doesn’t do much to calm matters as the cacophony of sound from the bass and synth descends with an emphatic, syncopating rhythm. The combination of KenKen’s virtuosity is riveting in the way he maneuvers deftly through the rhythms and sculpts that infectious energy; there were times where I wanted to participate by clapping along to that hypnotic display. It’s not until “a jealous flapper” that we see Kanno’s orchestral flavors arrive. Here, the melody sashays along exquisitely, carrying a hint of mischief before transitioning to a bold Eastern European sound that serves as the piece’s mainstay with only a slight detour towards a dreamier section. As with most Kanno scores, the sheer variety of genres and ethnic styles is part of what keeps Aquarion EVOL’s soundtrack exciting. “Pop-up Holy’s” synth track offers an absorbing atmosphere as those eclectic sounds merge together to create a pleasant array of whimsical music while “A’s” guitar introduction eventually gives way to a grimmer Irish melody. And then there’s “Altair Invasion,” which is interesting in that it starts off with a heavy march, adds a few Middle Eastern inflections in the strings to give it an exotic, alien tilt, before finally throwing the electric guitar into the mix to up the dissonance. Given the events in the anime, “Altair Invasion” isn’t the only grim track to rear its head. “Moonlight Requiem” rains down a menacing piano melody right from the get-go before Kanno adds a synth layer to accompany the piano, giving the entire presentation a sci-fi feel that is borderline cacophonous. Better still, “Kagura in the Wilderness” amplifies the tension through Sachie Oonuma’s viola solo. Her performance is absolutely discordant as her viola scratches bestow an uneasy aura upon the piece to the point where it continually grinds away at your sanity because of how wonderfully unpleasant it is. But somehow, I can never seem to let go of the past and still find myself gravitating towards the familiar tracks that graced Genesis of Aquarion’s score. Starting with “Holy Sound Wave’s” familiar choral lilt, Aquarion EVOL grabs melodic snippets from the first installment and are inserted or arranged for your listening pleasure. One prominent example involves taking “Aquarius’s” melody and setting it to an organ arrangement in “Genesis Carnival” to create a more rousing atmosphere once the organ lets the orchestra take over. Still, nothing quite captures the feeling of majesty like “Genesis History #2” which uses the ending segment in “First Love, Final Love” to, once again, exudes a stirring aura filled with hope and optimism as humanity progresses towards a more glorious era. Surprised you didn’t even mention Aquaria Mau Sora which is, in my opinion, the best song on this soundtrack. Kanno’s instrumental pieces from the last episode (5 of them, I think) are included on the Aquarion vocal album being released later this week. There’s also going to be a music CD included with the last blu-ray volume, but we don’t know what will be on it. And now that you mentioned it, I am surprised myself as that piece is just beautiful. From that introduction with the strings to the piano to the vocals which are just so profound in that balladic delivery (those lilts! ), makes it one awesome package. Well, I’ll be keeping my eyes peeled for that Aquarion vocal album then. Thanks for the heads up! Alright, I just listened to it. I don’t think you watched the anime, so I’ll tell you that track 16 (残響encore) is the instrumental piece that played during the finale. Tracks 17 & 18 are the new AKINO songs that played during the finale. There’s also a secret track 19 at the end of the album – a short new arrangement of “First love Final love”. Thanks for the update. Finally got a chance to listen to the mostly vocal disc and I really found the combination of the Sousei no Aquarion OP theme and Kimi no Shinwa in “Zankyou Encore” to be pretty decent, but the scene stealer was the last track effectively and I still find myself enthralled by that theme no matter how many times I’ve listened to it. Nice review, it was cool to read, after having listened to the soundtrack a few times through. I quite like the soundtrack. Yoko Kanno is awesome. I’m glad I got to see her perform in person even if it was just for a bit, in 2010 when she appeared as a surprise guest during the Macross Frontier concert. That was one hell of a moment, wasn’t it? I was pleased when she went on stage during that concert and made those bird songs and accompanied May’n and Mamegu on piano. Made it a great finish to the event overall.